New Scale Technologies has achieved full-scale production of 200 Cobra positioners per month at its advanced manufacturing center near Rochester, NY. Mature processes for production and testing enable New Scale to support fiber spectrometer programs with the volume, consistency and quality these endeavors require. 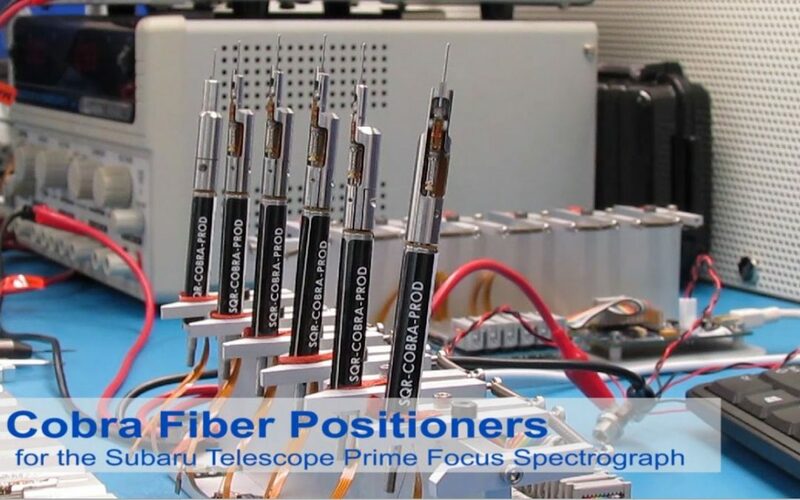 Victor, NY — June 22, 2016 — New Scale Technologies, Inc. has moved its miniature Cobra fiber positioners into full production, manufacturing 200 units per month for the Subaru Telescope Prime Focus Spectrograph (PFS). Using its mature manufacturing processes in a fully-staffed and fully-equipped manufacturing center near Rochester, NY, New Scale will deliver a total of 2,550 Cobra positioners to the California Institute of Technology by June 2017. Deployed in a close-packed array, the Cobra positioners rapidly configure an array of fibers in the prime focus of the telescope to a precision of 5 µm. They enable the Subaru Telescope to conduct a variety of targeted surveys for studies of dark energy, galaxy evolution, and galactic archaeology. Unique and patented rotary piezoelectric motor technology uniquely suited to the PFS application with reduced operating voltage (10 volts) and longer-life (> 400K cycles). Patented drive electronics that are sufficiently small and low power to be integrated in the close-packed Cobra arrays. 8 mm actuator array spacing with 9.5 mm diameter fiber patrol area. 5 µm fiber positioning with < 0.3 degree fiber tilt and < 25 µm fiber defocus. Ability to robustly hold position without power and zero backlash. Ability to efficiently converge to target positions. A global supply chain for the 32 unique Cobra components. Assembly tools, fixtures and processes sufficient for producing 200 Cobra positioners per month. Quality assurance and 100% in-line testing methods that verify all critical Cobra specifications. A highly trained and experienced micro-mechatronic manufacturing staff. The Cobra fiber positioner is a custom, two-stage rotary piezoelectric motor system with integrated drive electronics. For more information about custom development programs with New Scale Technologies visit https://www.newscaletech.com//resources/custom-engineering/. New Scale’s M3 “micro-mechatronic modules” are the smallest, highest resolution, most repeatable closed-loop positioning solutions available. Each M3 smart module integrates New Scale’s patented and proprietary SQUIGGLE® or UTAF™ piezoelectric motors, drive electronics, position sensors, micro mechanical guides and control technologies. These “all in-one” smart modules plug-and-play directly with an embedded processor and provide the fastest time to market with the lowest total cost.